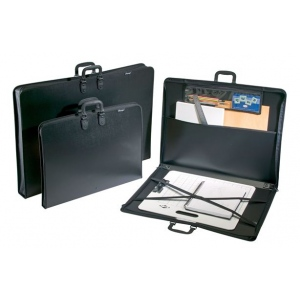 * Inside features a 6" x 17¾" zippered pouch for carrying smaller items as well as a full width large pocket for pads canvas art panels and more. * The other side equipped with crossing elastic straps with clasp to hold a variety of materials. * Includes an ID/business card pocket. The gusset size is 3".